Keeping up with your growing child means making sure they have the fuel they need to thrive. For many parents, planning healthy meals the whole family will eat gets most of the focus, but it's important not to forget about snacking. Kids have different nutritional needs and energy requirements at each age (not to mention ever-changing—or never changing—tastes). Unlike packing lunches or planning dinner, snacks tend to be more grab-and-go. But you don't have to sacrifice nutrition for convenience. There are plenty of healthy snack options for kids that are easy, portable, tasty, and packed with nutrition. Healthy snacking is an important part of ensuring kids have an overall healthy diet. The American Academy of Pediatrics recommends young children get at least two to three servings of fruits and vegetables every day. According to the CDC's Dietary Guidelines for Americans, many children (and adults) don't get the recommended amount of fruits and vegetables per day. Snacks are a great way to fix that. The abundance of sugary snack options available is known to contribute to childhood obesity and dental cavities in kids, but there are other reasons these choices aren't the best. While they might have the benefit of convenience, snack foods high in saturated fat, salt, and sugar don't have any health benefits. They also don't give kids the kind of sustainable energy they need to learn, play, and grow. Your child's snacking requirements will vary according to different factors, such as age and activity level. It's also important to note which types of foods are appropriate at each stage of development. In general, aim to keep snacks to about 100 to 150 calories each (including drinks). Toddlers typically need two to three snacks a day. At this age, choosing soft, semi-solid, and gradually more solid food items from a variety of sources is the safest way to introduce new tastes and textures into your child's diet. You can provide structured times for snacking, but allow your toddler some choices, such as picking between two snack options. Your child's level of hunger won't be the same day to day and can easily be influenced by activities and illness. It's normal for an afternoon snack to be left uneaten if something more interesting captures your toddler's attention, they're tuckered out and ready for nap time, or they simply get full before they finish. If you're concerned your child isn't getting enough to eat at snack time, you can adjust what you serve at meals or try offering between-meal snacks at a different time of day. Teaching and reinforcing healthy snacking starts now, even in these early years. As they get a little older, kids will naturally want more control over what they eat, when they eat, and how much they eat. Kids this age can usually go a little longer between meals and snacks than toddlers, but in general, they'll need to eat every three to four hours. Once your child starts school, they'll be making more decisions at meal and snack times. Focus on presenting options and adjusting snack times (and meals, when possible) to accommodate the normal fluctuations of your child's appetite (and preferences) from day to day. Snacks and midday meals may be built into their school schedule, but that doesn't mean these times will always coincide with when they feel hungry. Packing some healthy snacks for your child to munch on the playground or before after-school activities will help ensure they're getting the calories and nutrients they need to focus on schoolwork, play with their friends, and learn new skills. Helping your kids develop a positive relationship with the foods they eat will empower them to make healthy choices when presented with less healthy options. School-age children may be able to go longer between meals and snacks (especially if they're eating more at mealtime), but most in this age group need to eat every four to five hours. Older kids can have very busy day-to-day schedules. By this age, older children may have also started rounding out after-school hours with extracurriculars, sports, and, homework. It's not just their lives that are getting busier—their bodies and minds are, too. As your kids get closer to puberty, energy and nutritional requirements will be steady—but the growth spurt and high-energy demands of the preteen years are just around the corner. Use this time to build a strong foundation, both in terms of your child's physical health and nutrition knowledge. For school-age kids, having plenty of healthy, easy, and nutritious snack options available at home and on the go is important to supporting their overall health as well as reinforcing an empowered relationship with the foods they eat. Older children may have developed their tastes, but just because they know what they like (and what they don't) doesn't mean you should stop introducing new options. Snacks are a great opportunity to let kids explore, develop new tastes, and find new favorites. Many kids are also more comfortable helping in the kitchen and may show an interest in shopping, meal planning, and cooking. Baby carrots and apple slices have long been staples of healthy snacking for all ages, but there are plenty of other options you can try. If your child isn't a fan of certain foods at mealtime, after-school or half-time snacks are an opportunity to boost your child's daily intake of produce. In addition to balanced meals, snacks featuring fruits and veggies are a versatile and tasty way to increase your child's produce intake. These snacks are also great choices for active kids, as they're packed with vitamins and antioxidants. Many also have high water content to help your child stay hydrated. Getting kids to eat their greens is a struggle known to many parents. 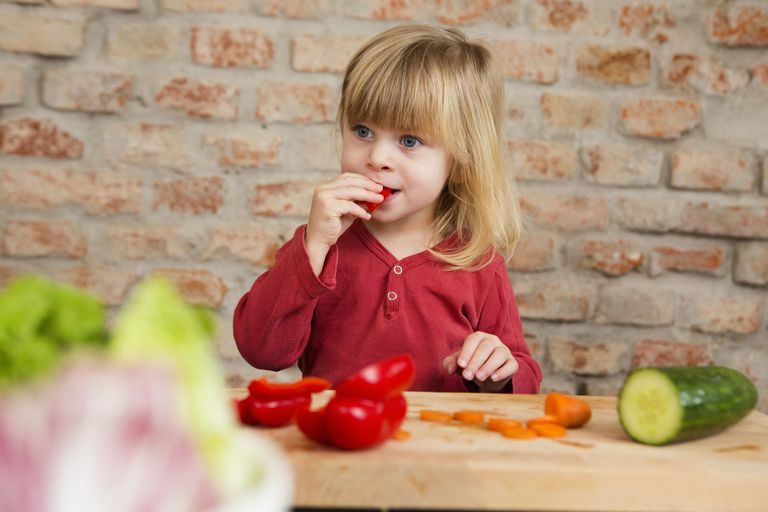 One way nutritionists recommend increasing your child's produce intake is limiting before-dinner snacks to veggies only. The reasoning? If your kid is hungry enough, they won't refuse whatever snack you offer. Serve vegetables raw or lightly steamed ones for maximum kid-friendliness and ease of preparation. Add yogurt, soy sauce, or a low-fat dip or dressing for more appeal (and sometimes, extra protein). Raw veggies also go great with guacamole, baba ghanoush, or salsa (and these dips are made of veggies, so you get two for one). You can also make veggies more enticing to little ones by cutting them into fun shapes. Try serving them in a creative new way, such as in a muffin tin or a cute cup. You can also turn snack time into a learning opportunity for kids still learning their colors by arranging bites in rainbow order. Sweet, colorful fruit is usually a big hit with kids. Pair it with a protein snack or a dip made with low-fat yogurt, cream cheese, or nut butter to boost nutritional value and make the snack more filling. Fresh fruit: Try apples, bananas, grapes, berries, cherries, peaches, plums, pears, oranges, tangerines, clementines, grapefruit, melon, kiwi, pineapple, mango, or whatever your child takes interest in. Serve it whole or mixed as a salad, or line up chunks on a skewer for a fruit kabob (use a wooden skewer and snip off the sharp tip before serving to young children). Dried fruit: Try raisins, cranberries ("Craisins"), apricots, prunes, dates, and fruit leathers or roll-ups made from 100% fruit. Check labels carefully, as many "fruit snacks" and leathers contain mostly sugar and few of the nutrients found in whole fruits; you can also dehydrate your own fruits. Remember: Large chunks of hard, raw fruits and vegetables can be a choking hazard. Use caution when serving them to children under 5 (or consider other options). Chop them into small pieces or steam lightly to soften, but just be sure to let them cool before serving. While vitamin and mineral-packed produce will take care of much of your child's daily nutritional needs, be sure to round out snack options by adding whole grains, protein, and healthy fats. Here are a few basic ideas to get you started, but to keep kids interested, try using these as a base and letting them get a little creative in the kitchen. Water: If kids are bored, slice up some fruit for added flavor without adding sugar, dyes, or carbonation. Low-fat or 2% milk: If your child is lactose intolerant or doesn't like cow's milk, try a milk-alternative like unsweetened almond or oat milk. In moderation, sweet snacks and special treats are an important part of developing a healthy relationship with nutrition. Eventually, every parent will be confronted with less-than-ideal snacking options, either due to time or money constraints (or birthday parties), and these occasions are by no means failure. Whether treats are planned or not, the best thing you can do to help your child is to keep portion sizes in mind. Prepackaged foods may contain more than one serving, so it's helpful to check the nutrition label and portion out snacks. After sugary snacks or drinks, remind your kids to brush their teeth. If your child's overall snacking habits are healthy, don't detract from meals, and provide them with the energy they need, the occasional treat is just another part of a balanced diet. Stanford Children's Health. Child Nutrition. Stanfordchildrens.org. https://www.stanfordchildrens.org/en/topic/default?id=school-aged-child-nutrition--90-P02280. Published 2019. Should You Let Your Kids Drink Flavored Water?